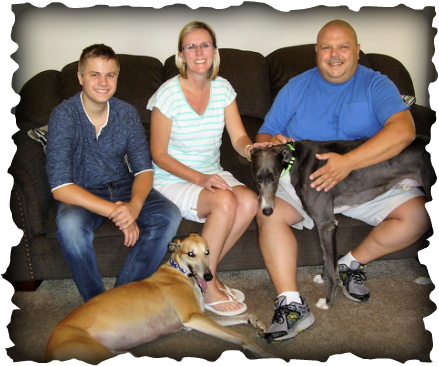 Sonya, Tim and son Luke of West Carrollton love fostering for GAGC, but they couldn't let blue boy Canaan Tarasenko leave. He is now officially theirs and is called Mako, like the slender grey and white shark. Luke mentioned that it will be easy to tell in the photo which dog has lived with them for a year - Kruzer was feeling pretty laid back. He and Mako get along great, and Luke said since they have a red and a blue greyhound, the next one needs to be white. We can arrange that! We will see this family at lots of events with their two handsome boys.